While browsing social media sites and doing research on Microsoft, I came across a video on YouTube titled “Microsoft’s Concept of How 2019 Will Look Like.” This peaked my interest because I haven’t seen any video of Microsoft’s Future Vision Concept at all for the year 2019 (roughly). I had no idea that Microsoft thought that far into the future for technology either. It’s interesting how a company will formulate a “vision” or a plan of what the future has in store for us and what sort of things we can expect. The YouTube video itself is clever and pretty spectacular. The video opens with a girl and boy interacting online internationally with (what looks like anyway) a holographic board. They exchange messages through writing text and pictures using their fingers to produce lines. After a couple of scenes, it cuts to a wide shot of a classroom and someone interacting with a full holographic or surface “smartboard.” The video goes on to show touch screen displays in airplanes, businesses, at residential homes, and pretty much everywhere you turn. Some of these touch displays are used on glass tables and windows. They also show interactive displays on coffee mugs, note cards, and even newspapers (reminds me of the Daily Prophet and the moving pictures from the Harry Potter universe) showing information such as news and weather. Incredible magic indeed. It goes without saying that the technologies showed in the video are pretty ambitious and that Microsoft will have a lot on their plate (trial and error, lots of testing!) if they want to produce these ideas in the next seven years. But there is hope because some of the “future tech” shown in the video is plausible even by today’s standards. Microsoft has released their Surface tablet and I can see airlines having touch screen displays on their planes in the very near future for customer convenience. There are some refrigerators that are out today that have touch screen panels and even have cameras to take inventory of what you have. If most or even half of this technology is possible by the year 2019, the social media and networking scene will explode with the amount of new possibilities. Imagine waking up or walking into your business and seeing news feeds, sports, and/or social networking updates displayed on glass. Or even presented on interactive newspapers. Retail stores could have a whole new way of displaying product to customers. Social media experts will have new ways of getting the information to its customers. I’m even sure its possible in the future that people could pay online bills without having to go to a computer monitor and using a web page. 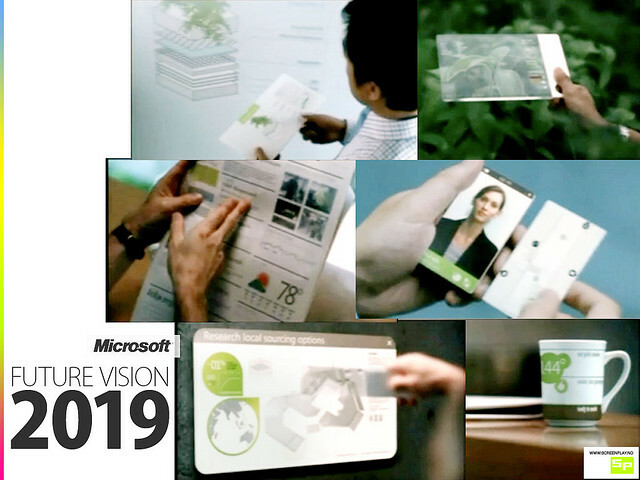 2019 is seven years away and Microsoft sure does have work ahead of them if they do want to have their complete “Future Vision.” Microsoft’s Concept of 2019 video is posted below. This entry was posted in Uncategorized and tagged 2019, Concept, Future Vision, Microsoft, Social Media, Surface, Week 11 Original by johnkrupa. Bookmark the permalink. These new concepts are remarkable. I have never seen nor even though about anything like that before. For Microsoft to develop this type of technology is mind-blowing. I just don’t really know how plausible this is. What they were doing in this video were things that I have never seen or have seen anything close to it. This new system seems completely user friendly. Drawing pictures of a dog on a clear screen and then having that instantly translated to a new language was something that will change the future. Everyone in the world will have this new technology and they will be able to communicate with anyone in the world without a language barrier. This would revolutionize the way social media is run. People can communicate with everyone in the world. Social media as a whole will be able to grow faster than ever imagined.